While he might be a bit embarrassed to be labeled with such a lofty descriptor, Richard Richards is, nevertheless, often described by students and colleagues as a Renaissance man. 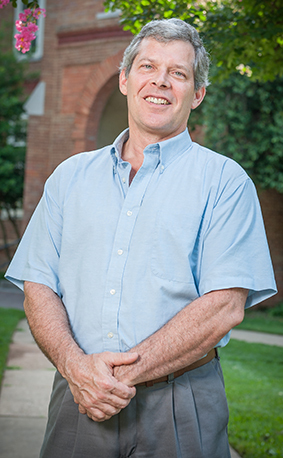 Richards, a professor in the Department of Philosophy, joined the College’s faculty in 2000. He is a philosopher and noted scholar on the history of science, particularly the work of Charles Darwin. He has also had successful careers in professional dance and fine art. His students comment on his signature talent for applying his varied knowledge and experiences to a topic. He is also known as a person who simply loves to learn. Richards grew up in Ogden, Utah, and earned his undergraduate degree from the University of Utah. Inspired by Mikhail Baryshnikov, Richards embarked on a career as a professional ballet dancer. He danced with professional companies in Belgium and Norway and competed in the 1986 Varna International Ballet Competition in Bulgaria. In 1989, after a career-ending injury, Richards took this detour as an opportunity to explore a second artistic endeavor. An accomplished landscape artist, Richards was selected as a Yosemite National Park artist in residence, which allowed him to reside in a cabin on park grounds with only the stipulation that he donate some of his works to the Yosemite museum. That same year he was accepted by Johns Hopkins University to study in a graduate program that specializes in the history and philosophy of science, medicine, and technology. Although he would have loved to continue painting, Richards said, he had to make a choice. As an undergraduate, Richards was fascinated with the philosophies of David Hume. In his graduate studies, under the tutelage of noted philosopher of science Peter Achinstein, he continued to learn about Hume and other philosophers. Richards would address this question and others as he studied the work of Charles Darwin. Some of Richards’s first published works were related to Darwin’s theories on domestic breeding. More recently Richards has researched Darwin’s theories of sexual selection, which states that some individuals out reproduce others of a population because they are better at securing mates. According to Richards, Darwin’s theory of sexual selection was largely ignored by the scientific community for many years. Since sexual selection theory relies heavily on the concept of female choice, the “unsavory” connotations were not consistent with Victorian Era thinking, in which modesty and prudishness were upheld as ideal traits for women. Richards also explains that thinking of the time believed that female choice was capricious and thus not consistent with the theory. Society at the time was more comfortable with the idea of evolution being about survival instead of success at sexual choice. Recently, however, sexual selection theory has become much more important for many fields such as evolutionary psychology. Richards has contributed his own scholarly work on the sexual selection theory to The Cambridge Encyclopedia of Darwin and Evolutionary Thought, published earlier this year. Richards’s 2010 book, The Species Problem: A Philosophical Analysis, was published by Cambridge University Press, and he is under contract for a second book on the topic of biological classification. Richards uses his expertise on Darwin and his enthusiasm for looking at world issues from a philosophical perspective to enhance his teaching. In a course on philosophy and evolution, Richards invites students to learn about evolutionary theories before Darwin, dating back to the ancient Greeks. The course also explores the application of evolutionary theories to other philosophical issues: ethics, epistemology, and aesthetics, among others. He has also been instrumental in developing a philosophy of medicine track for the department, which includes a study of biomedical ethics that will appeal to students who may be pursuing careers in medicine and health care. To develop this track, he is drawing on his previous curriculum design experience.  When Richards first came to UA, he was brought in to assist with the development of the foundations course of the Blount Undergraduate Initiative, the College’s interdisciplinary liberal arts program for high achieving students. Richards and a committee of faculty members from throughout the College worked together to decide on core texts that would be used in the foundational course. A student at heart, Richards brings this thirst for knowledge into everything he does in academia, the arts, or elsewhere. But Richards said that philosophy has been a constant when going after the answers to the bigger questions.